This musical house party will be hosted by mis amigos, Juan Rivera and Pedro Gomez. They will introduce to Son Caletano. For Pedro and Don Ricardo, this is a deep-rooted family tradition. 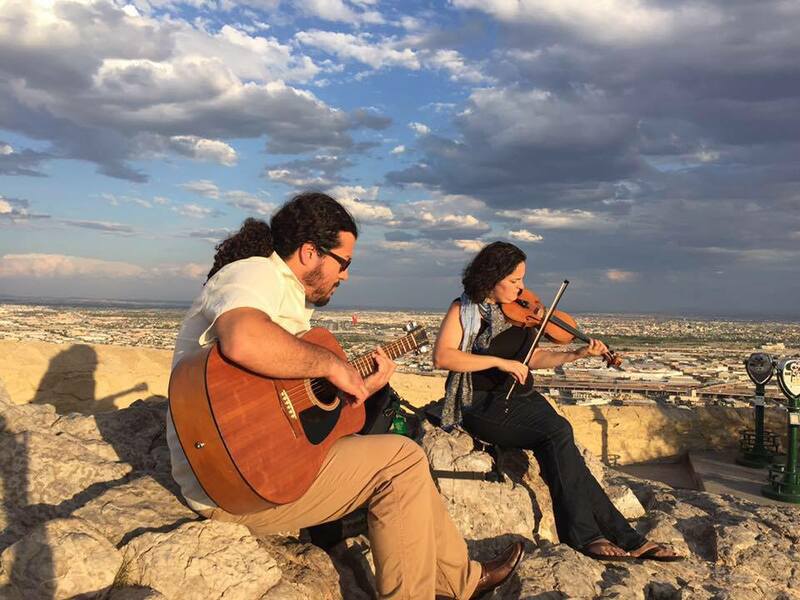 For Juan, it is the music of a neighboring region. (The video below was filmed at a party in Juan’s back yard in Cicero last summer.) Let this night be a party, and let us all be open to what can happen when musicians get together to play, and talk a bit, about the music they love. There will be playing and singing and, hopefully, a little dancing. Perhaps there will be a little teaching for those of us new to Son Caletano. Don Ricardo Ibarra was born in 1941 in Tiquicheo Michoacán, part of the “Hot Land’s” region (La Tierra Caliente). His Father, don Miguel Ibarra, was a very important fiddler in the region of the Son Calentano. He played with many important musicians of the region and was a contempory of don Juan Reynoso, known as the “Paganini de Tierra Caliente”. He taught his 4 sons to play the music since they were children and also his nephew Serafín Ibarra*. 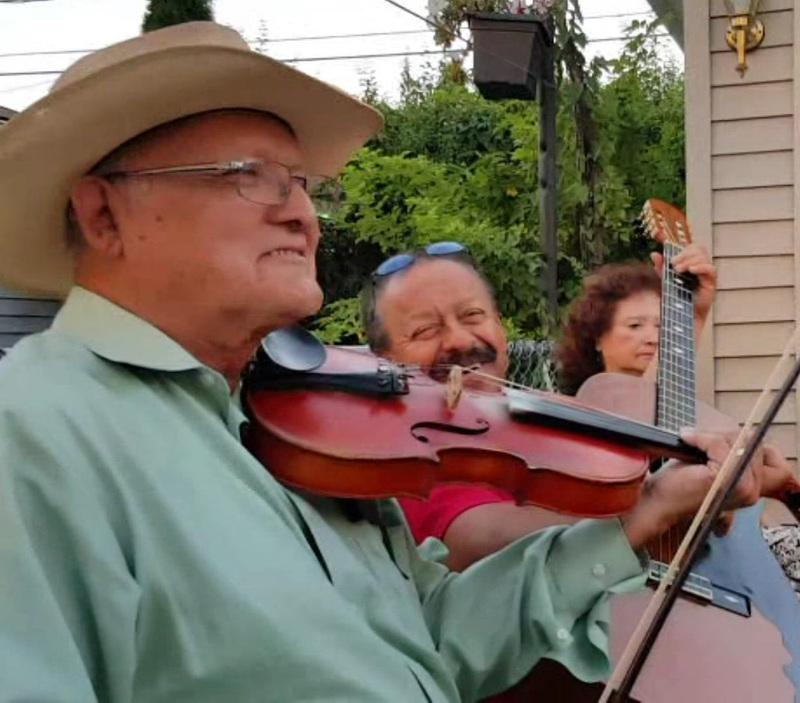 Don Ricardo Ibarra’s first instrument was the guitar and vihuela, but after his older brother Enrique died in 2005, he took up the fiddle again and started to play it since then with his brothers Miguel and Guadalupe and his cousin Ismael. Here’s a link to an article en Español that Juan wrote for the Federation de Clubes Michoacana en Illinois. *Serafin Ibarra has appeared on stage at the Old Town School of Folk Music several times. I took a workshop with him at the School’s Festival of Mexican Son in 2005. A concert set, followed by a jam/workshop. they could be our featured guests on a visit back to Chicago. Here are a couple of tunes to help you get ready. The first is a gusto from Tierra Caliente, a style known as Son Caletano. Maria says, “We learned this tune from master teachers Serafín Ibarra and Jesús ‘Chucho’ Peredo.” Maria once had the opportunity to study with the grand master fiddler from that region, Don Juan Reynoso, who passed away in 2007 at the age of 94. The second is a tune from the Purepecha, one of the First Peoples of Michoacan. Here is a simple, but lovely dance tune from Cleofes Ortiz, taken from a cassette album recorded in Bernal, New Mexico in 1986 by Jeanie McLerie & Ken Keppeler. The album due to be reissued on CD by Ubik Sound. Until then, a CD is available from the webite for Bayou Seco, Ken and Jeanie’s band. There you will find this biographical sketch of Señor Ortiz, and more. Valse de los Paños is a waltz danced with handkerchiefs. A description of the dance from the early 1900s can be found in a book by Aurora Lucero-White, Folk-dances of the Spanish-colonials of New Mexico. Here are the ABCs. Note the key change to D for the B part . 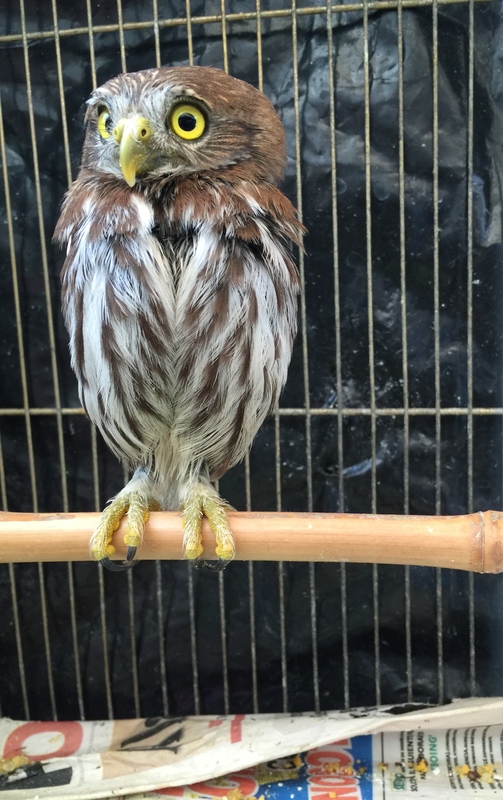 . .
From the Huasteca region, i.e., northern Veracruz. That’s in Mexico. 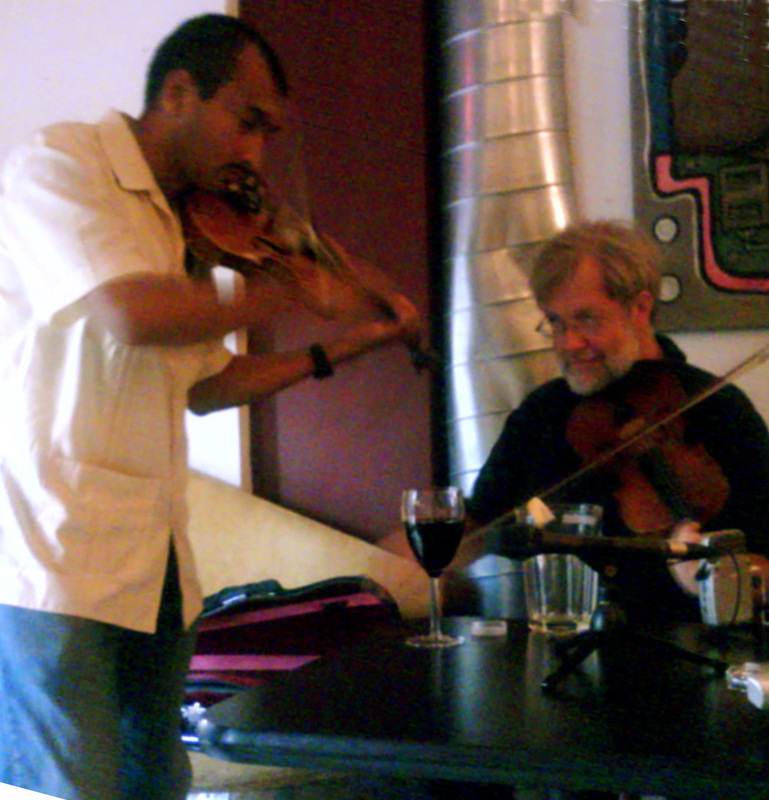 The fiddler is Osiris Caballero who visited Fiddle 4 Twin Fiddle last week. His group, Los Utrera performed at World Music Wednesday the next night. Thanks to Yahvi Pichardo for arranging this visit. Yahvi and Maria McCullough assist in this rendition of La Cielito Lindo. 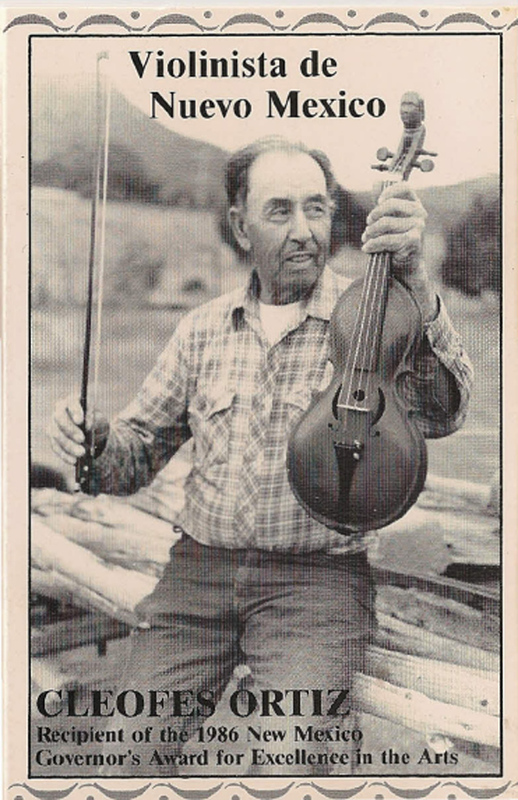 Another version in the Son Huasteca style can be found on the CD Folk Songs of Illinois #2: Fiddlers, played by Chicago’s own Sones de Mexico. Full disclosure: I co-produced this CD. Our special meeting on July 20 featured a presentation and workshop on Son Huasteco, the traditional music of the Huasteco region of Mexico. Son Huasteco includes three types: danzas, sones de carnival and huapangos. The first two are associated with the fiestas and ceremonies of the indigeous people. Some have singing, others are instrumentals. Huapangos are played for social dancing (fandangos) among the mestizos, and feature both sung verses and instrumental solos. 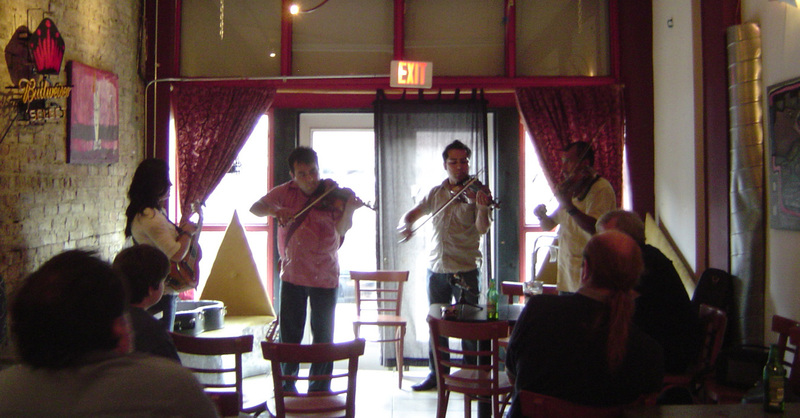 Our featured guest, Felipe Valle demonstrated the improvisation and ornamentation used by Son Huasteco fiddlers. El Caballito, a carnival song. Felipe was joined by Juan Rivera of Sones de Mexico, and Irekani Ferreyra and Anabel Tapia of Tarima Son. (By the way, Tarima Son won first place in the Fiddle Band division of the Midwest Fiddle Championship at the Chicago Folk & Roots festival earlier in July.) Juan and Irekani both played fiddle with Anabel on jarana. Felipe often plays with a haupanguera strapped to his back, so he can quickly change between strumming the chords and bowing the fiddle. The deep voice of the huapanguera is prominent in this sample of the conjunto sound of Son Huasteco. 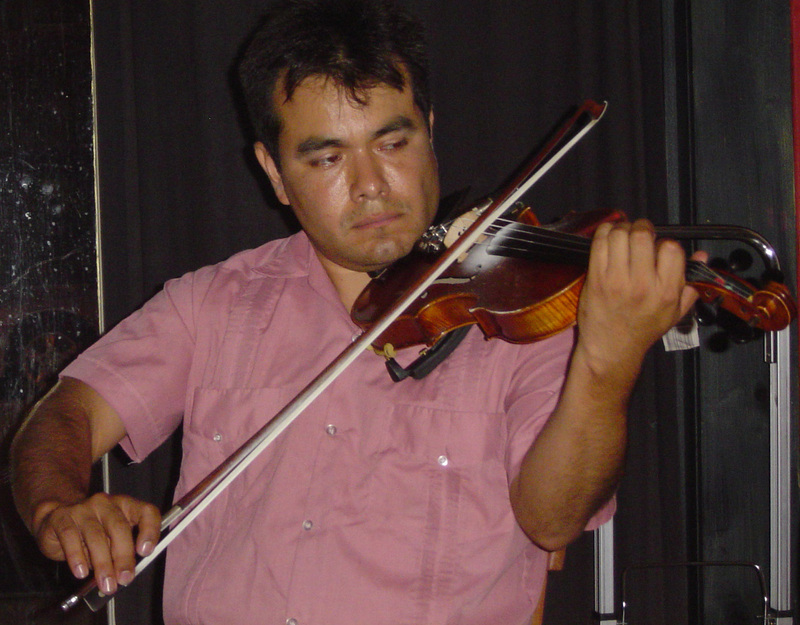 The typical line-up for a Son Huasteco trio is fiddle, jarana huasteca and huapanguera. 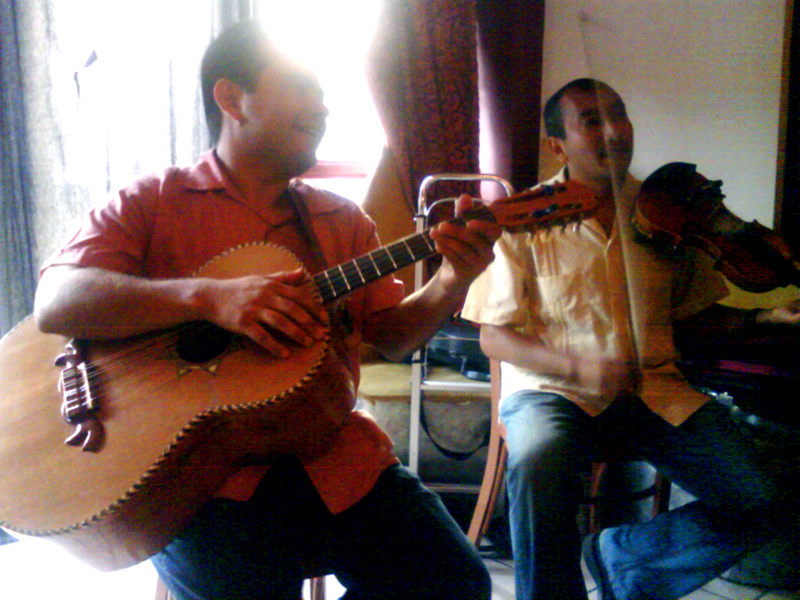 The jarana, an 8 eight-string instrument with 5 courses (a bigger version of the ukulele), is also common in Son Jarocho and other regional styles of Mexican folk music. Here, the jarana section was augmented by the late-arriving Juan Dies of Sones de Mexico. Fiddle Club members had a chance to learn and play four or five pieces from the Son Huasteco tradition. Thanks to Debi Lewis and Pete Janotta for the photos. An announcement of the Fall 2008 season of the Fiddle Club will be forthcoming in the next month. Stay tuned. Our featured guest artist is Felipe Valle, “El Huracán Huasteco,” in town for July from Mexico City. 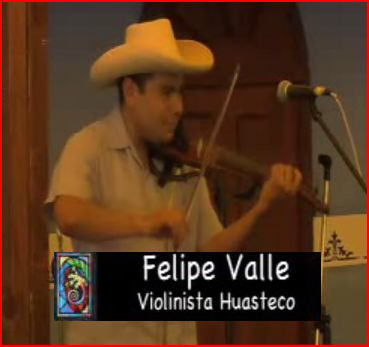 Felipe is a young master of Son Huasteco, a regional style of folk music from the area north of Veracruz. The favored rhythm of Son Huasteco, called ‘huapango,’ is well-suited for zapateado, (Mexican step-dancing or clogging). Son Huasteco features virtuosic and flamboyant fiddling, alternating with improvised vocals with a distinctive yodel. 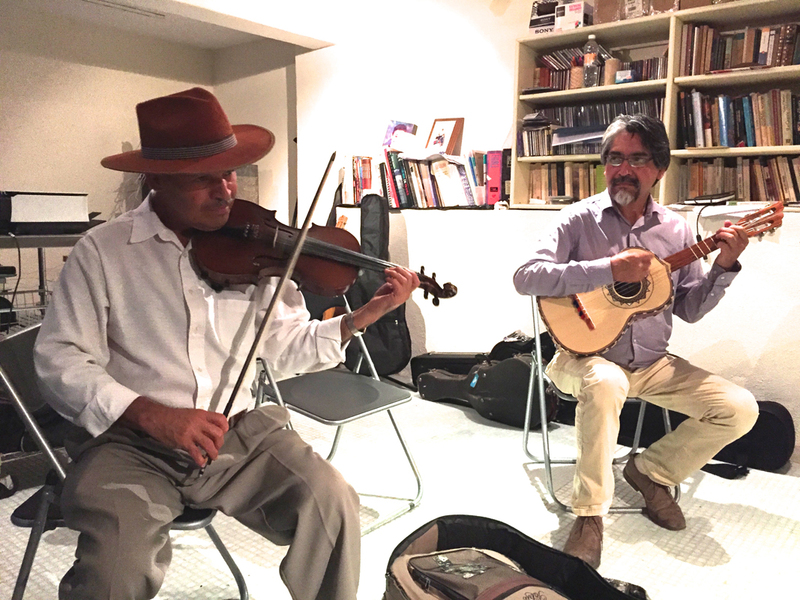 Accompanying Felipe will be his long-time friend and musical compadre Juan Rivera, fiddler and multi-instrumentalist with Sones de Mexico. To hear some tunes from Felipe and Juan, click here. The Fiddle Club of the World (Chicago Chapter) welcomes players of all instruments and listeners who want to sit up close to masters of traditional dance music. A simple huapango in the style of Son Huasteco. slow version of Las Chaparreras. A more complicated Son Huasteco huapango. Felipe Valle & Juan Rivera are the featured guests for the Fiddle Club of the World’s meeting on Sunday, July 20 at the Leadway Bar & Gallery (5233 N. Damen).